York University Libraries, Clara Thomas Archives and Special Collections, Toronto Telegram fonds, ASC04612. Often when we study activism surrounding an issue like abortion, we do so in isolation, paying little attention to the multiple protest identities of activists. While I hadn’t anticipated writing an article on connecting abortion rights to anti-war activism, my interviews with Abortion Caravan participants revealed particularly strong claims of attachment to or identification with opposition to the Vietnam War that demanded further exploration. Some of the Caravaners came to Canada with draft-resister relatives from the United States, while others lived in communal housing with draft resisters and deserters. The majority settled in Vancouver and Toronto, the two cities in which most of the Caravaners lived. Many women recalled their commitment to anti-war activities, including helping to smuggle deserters over the border into Canada and attending and organizing demonstrations and forums for peace. This post explores these linkages, drawing connections between the tactics used by activists in the pro-choice and anti-war movements as well as their competing interests. Several tactics women used in relation to the Caravan mirror anti-war actions, illuminating the spillover of the women’s protest identities. For example, members of the Vancouver Women’s Caucus (VWC) who organized the Caravan, threatened war against the Canadian government. As such, they signalled, at least symbolically, their ability to act autonomously and their unwillingness to soften their opposition to the 1969 abortion law. Their use of symbolism also extended to protest strategies. At anti-war protests in the United States, it was common for men to burn their draft cards to show their rejection of the war, and by extension, the authority of the state. Similarly, when a group of Caravan supporters protested outside Parliament Hill, they burned a copy of the abortion law. The Globe and Mail quoted one woman as having told those assembled, “The legislators made this murderous law…. They won’t listen to us. We are forced to declare war. Women are enslaved.” These statements illustrate that the federal government had lost legitimacy in the eyes of the women who planned and participated in the Caravan. Others were confused about their priorities. One woman commented: “We’d been planning this thing [the Abortion Caravan] for a long, long time…. Imagine how torn we were. We, who’d been very much a part of the anti-war movement, now we’re sort of duty-bound to go and carry on this thing which we’ve started, but the whole focus of the movement that weekend is somewhere else.” Another woman remembered: “Of course for us the excitement was … what was going on here in Toronto…. All the women went to Ottawa and all of the guys had the biggest, most militant demonstration ever around Kent State…. On our way there [to Ottawa] was conflict because we were there doing the Abortion Caravan, but our hearts, for many of us, were in Toronto because that was such a big deal.” Although many women supported the fight for abortion rights generally, since they perceived that it was connected with women’s equality overall, these reflections reveal that for some of them abortion may not have been their “key” issue. It underscores, too, the idea that women had strong attachment to the anti-Vietnam War activism, perhaps stronger than is sometimes recognized. Placing women’s abortion rights activism within the context of their other protest identities helps to complicate our understandings of the history of abortion rights activism as well as that of Canadian second wave feminism more broadly. Women’s memories about their participation in the Abortion Caravan reveals gradations of identification with or ownership over the issue that add depth to our understanding of women’s activism as a series of negotiations between or the privileging of identities and priorities. Shannon Stettner is a Post-Doctoral Visitor in the Department of Political Science at York University. 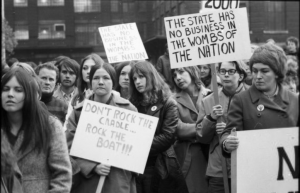 For an extended analysis, see Shannon Stettner, “‘We Are Forced to Declare War’: Linkages between Women’s Anti-War Protests and the 1970 Abortion Caravan,” Social History/Histoire Sociale 46, no. 92 (November 2013): 159-178. All quotation in the text are from this article or from Shannon Stettner, “Women and Abortion in English Canada: Public Debates and Political Participation, 1959-1970” (PhD dissertation, York University, 2011). Richard L. Hughes, “Burning Birth Certificates and Atomic Tupperware Parties: Creating the Antiabortion Movement in the Shadow of the Vietnam War,” The Historian, vol. 68, no. 3 (2006), p. 542.
to Ottawa in 1970 is very interesting. In my book, “Winning Choice on Abortion”, I go into detail about how shocked the women of the Caravan were to learn about the shootings of students at Kent and Jackson state colleges in the U.S. And how many of the Caravaners managed to join in the anti-war demo in Toronto on Thursday, May 7, 1970, and then get to Ottawa, their actual destination, on Friday, May 8. That began a series of extraordinary actions in defence of women’s right to choose, in the House of Commons and at the PM’s residence. days before leaving on their cross-country drive to Ottawa. Thank you, Ann. Your book was very helpful when I wrote my dissertation and I’ll be sure to work those details into the manuscript revisions.